There are numerous identification software applications available. We suggest using Asure ID because it is user friendly and easy to go from installation to printing. Uploading a database is vey simple to do in Asure ID and requires the excel file and a few clicks of the mouse. To get Asure ID Tech Support on older versions 4, 5, or 2009. Tech support is no longer offered by the manufacturer on versions 4 or 5. Over the years we have migrated towards Asure ID because of its ease of use and the support available to us from the manufacturer on the product. We don't get many technical support questions on the product because it is easy to understand. 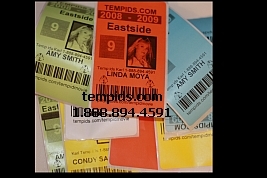 We will even design the ID badge for you to load in Asure ID. We have also produced video tutorials on how to use the ID software personalized for each customer accessible on the internet. We have Asure ID on our desktops and laptops for support in the office and in the field. We can help you with rolling over databases, record deletion, batch upgrading, and adding a bar code to the ID badge. In addition to Asure ID, other mainstream identification software include Episuite and Polariod ID Card Maker. One of the mainstream software applications we used was Episuite, but we got away from them as we saw the technical support on the product dwindled from 30 days to one hour. Interestingly enough, I recall a conversation with someone in the Episuite sales division that asked why we weren't selling more of their product and I mentioned that their technical support was only one hour. This person insisted that it was sixty minutes of support which I said was one hour. I think someone in marketing suggested that saying 60 minutes sounds like a lot and that one hour doesn't sound good at all. Asure ID has been generous with technical support. Contacting Customer Support LIVE! will place you in touch with technical support so that we can address your issue. Many issues can be addressed and fixed over the live chat available when you link up with customer support.